Alrighty… I’m finally back after 25 days of trekking… I decided to combine two treks into one, so it took a little longer than expected. 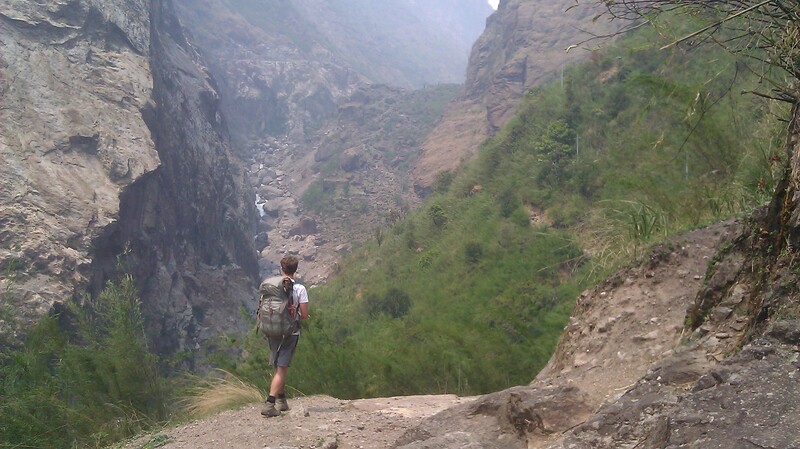 The first of the two treks is known as the the Annapurna Circuit Trek… it’s one of the two most well known treks in Nepal, and probably right up there in terms of the most well known treks in the world… and it’s something I’ve wanted to do for quite some time (I think I’ve said in a previous post that, when I set out on this trip, the three places I really wanted to see were Ibiza, Ethiopia and Nepal… with trekking in Nepal being the main reason I wanted to come here, and the Annapurna Circuit being one of two treks that I felt I must do). 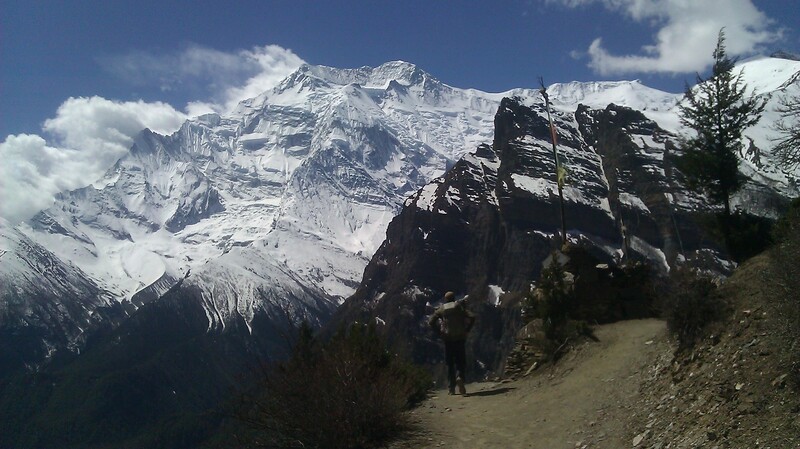 The trek is an approximately 300-kilometer loop (or 186 miles for those of you who think in standard) around the Annapurna Mountain Range portion of the Himalayas. 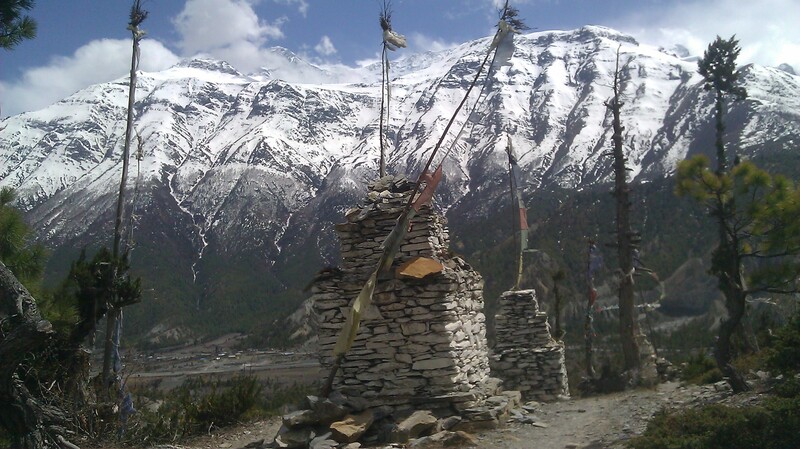 The route allows you to get all up close and personal with some of the highest mountains in the world while not having to bring much other than some cold weather gear (you see, the Annapurna circuit is what’s known as a “teahouse” trek, where places to stay and places to eat abound in every village one passes through… and, since the whole route is part of a former trade route with Tibet, there’s villages everywhere). 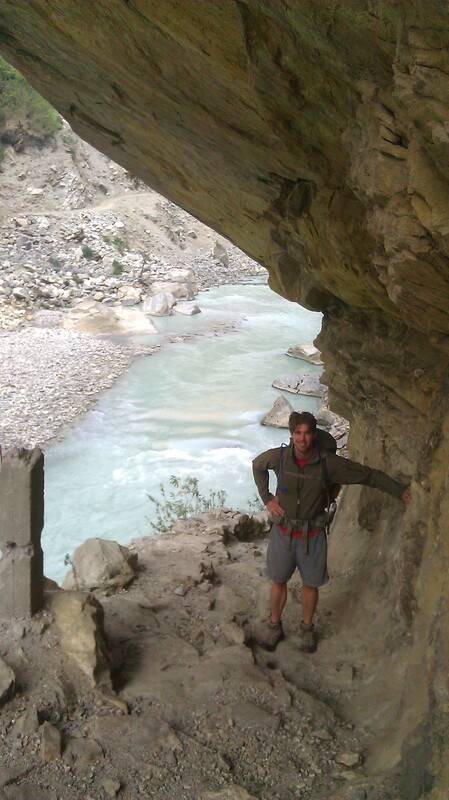 As an added bonus, my friend Ben was coming out to join me for the trek. 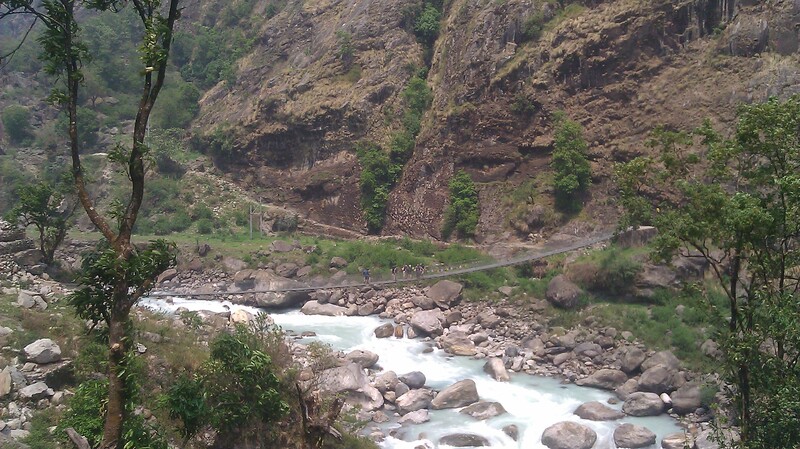 The start of the trek features tiny Nepali villages, lots of green, a river that was very, very blue and suspension bridges everywhere. From my perspective, and when you look at a map of the route, the trek is roughly circle-shaped and contains three parts, which I’ll call the ascent, the pass and the descent. 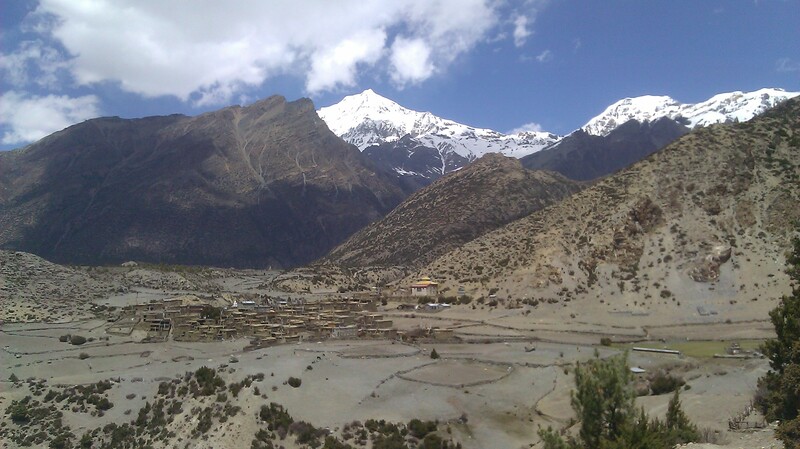 Right in the middle of the trek, or the top of the circle, is the Thorung La pass, which is 5,416 meters high (roughly 17,760 feet… for comparison, the highest point in the lower 48 states is Mt. Whitney in California, which is about 14,500 feet / 4,420 meters), so the first part of the trek is spent working your way up in altitude toward Thorung La (beginning at Besisahar, which is only 760 meters, or 2,500 feet, in elevation), then you cross the pass, and the last part is spent descending all the way back down (more or less). 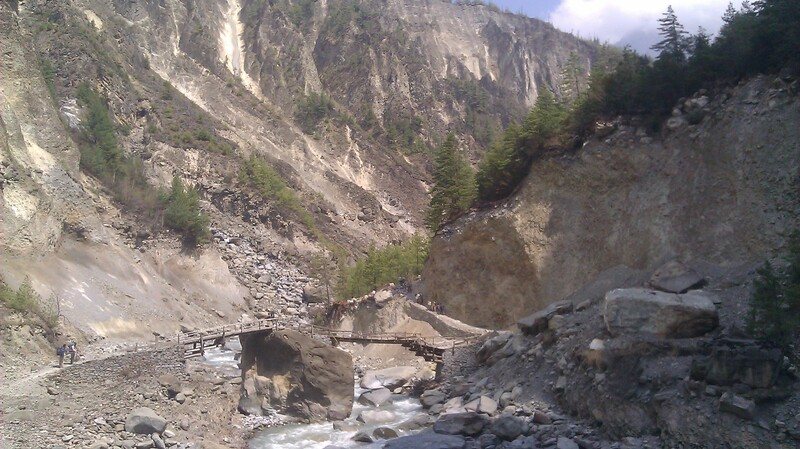 As I did a bit of research on the trek (yes, I actually read some things about it before I went… ), I found out that the Nepalese government completed a road connecting all of the towns the descent portion of the trek in 2008, much of which went over the original trekking and trade route. The road, according to the guidebooks, supposedly ruined that portion of the trek (as nobody wants to walk along a dirt road with jeeps, buses and trucks careening by you all day)… so most people elect not to do the descent portion of the circuit anymore, they just take a jeep back to Pokhara (Nepal’s second largest city and main staging point for the Annapurna Circuit). I figured I’d walk the whole thing anyhow as I don’t know when I’d get another chance to do it again (and I somehow convinced Ben to walk it as well)… plus, if it turned out to be as bad as everyone seemed to think, we could hop in a jeep ourselves. One of, if not the, worst part about this trek is the bus ride to the starting point (Besishahar) from wherever you may be… from Pokhara (you can do it from Kathmandu as well) it was a very miserable, bumpy, dusty and hot 6 hours on a bus that actually had roaches (yes… really, but they were small if that makes a difference). I know… you may be saying to yourself that you think you remember me writing about enduring a 5-week long sojourn through India via trains and buses, and that shouldn’t a rather short (by comparison) 6-hour bus ride be easy for me? That’s what I thought as well… but it wasn’t. Maybe it’s just that now I think that a 6-hour bus ride should be easy, but, actually, any 6-hour bus ride (in not exactly what one would call comfortable conditions) is still hard… so maybe it’s something about expectations? Or maybe it’s something to do with the Indian train system being the both transportation as well as one of the main elements of that trip (and note, there were roaches, mosquitoes and mice on the trains as well), while this bus ride was, literally, just a vehicle to get me from point A to B to start the trek? Whatever the reason, Ben and I were both very glad when it was over… we literally jumped off the thing when instructed to and quickly found a room to settle into. 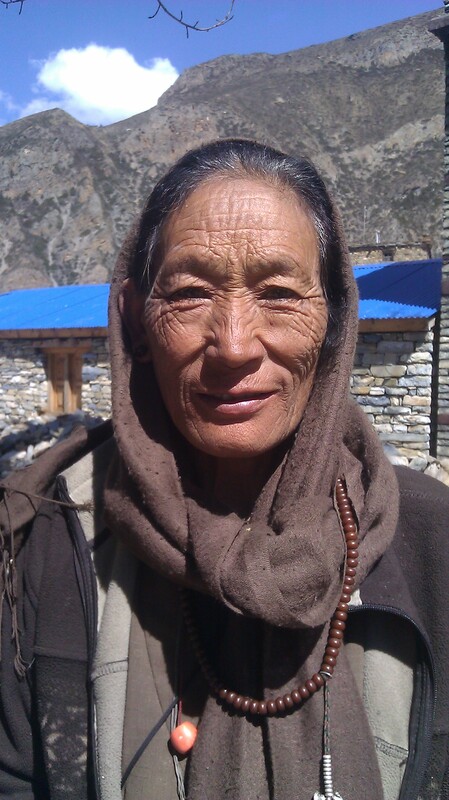 A lovely tea seller at the top of a steep climb on Day 5. 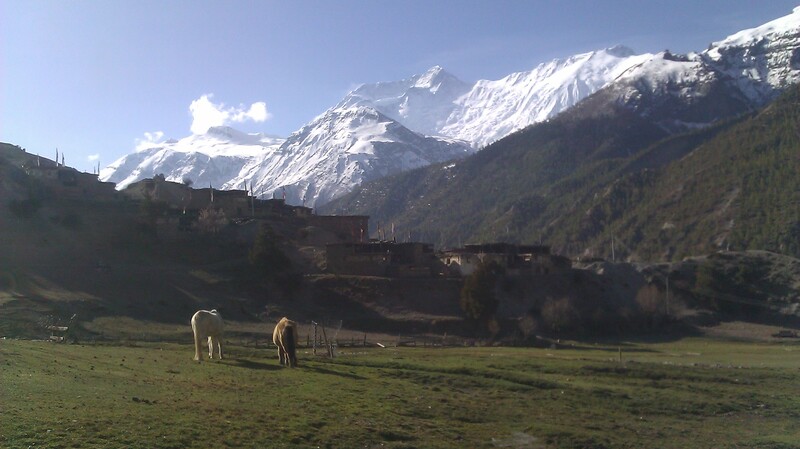 The view walking into Manang from Bkarka on Day 7. Our first night we learned one thing that was to hold true throughout the trek… rooms are cheap, but food is expensive (and in return for the cheap room you are expected to eat most, if not all, meals at the hotel in which you are staying). And when I mean the rooms are cheap… I mean really, really cheap… most rooms were generally between 100 and 150 Rupees, which is $1.20 to $1.80 (split between the two of us). The funny thing was that the quality of the room didn’t seem to matter for the price… some had attached bathrooms, some had hot water, some had western toilets, some had nice beds, some had squat-toilet outhouses, some were without power, some had walls and floors made of packed dirt, some had walls so thin you could nearly see thorough them, some had mice, some had giant centipedes, some had what seemed to be wooden cots with no padding, some had blankets that smelled like yak piss… no matter… all rooms were 100 to 150 Rupees. And in general, with varying levels of quality, they were more or less the same… about 12 feet by 12 feet with two single beds made of wooden boards, with a mattress over them, clean sheets and one thick, unwashed, blanket per bed. 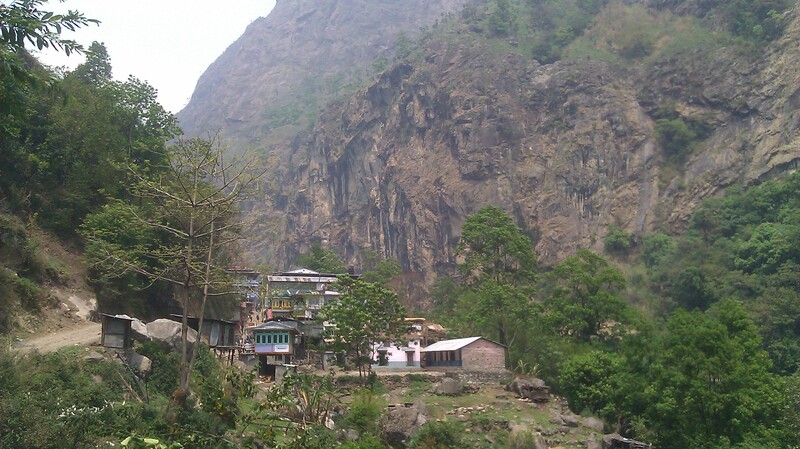 Now the corollary to the cheap rooms is the over-priced food (by Nepali standards anyhow) with meals and drinks generally becoming more and more expensive the higher and more remote one gets. As with the rooms, the menus were more or less the same as well… pizzas, pastas, tea, coffee, soups, fried rice, chow mein, curries, momo’s (Tibetan dumplings), varying types of breads and a couple of Nepali dishes (and, occasionally, somewhat exotic choices like Mexican food… which I would never eat in Nepal (one rule of thumb I’ve found that works is never to eat any food from more than one country away from the one you are in, excluding western style breakfasts anyhow, for example, you really don’t want to eat India’s take on nachos… take my word on that one). Breakfast was generally some sort of porridge, maybe some eggs and maybe some kind of pancakes. Anything bottled… beers, cokes, water, etc… was generally expensive (which makes sense considering that at some of these places all this stuff has to be carried up there either on a mule of a by a person). Usually the best value for your money was the Nepali dish named Dal Bhat… a plate of rice with lentil soup (dal), a potato curry, some kind of sautéed vegetable (usually spinach) and a papad (a fried rice chip/wafer dealio)… what dal bhat really has going for it though (and why it’s the best value) is that once you are done, the servers will come around a give you a whole other serving of the rice, dal and potato curry… so, in effect, you get two meals for one (although the price of dal bhat on the menus was generally 50% to 75% higher than the other meals)… for me, this was really the only meal that would fill me up after a long day (or morning in the case of lunch) trekking. The price of dal bhat ranged from 300 Rupees to 600 Rupees ($3.60 to $7.20), which, in western terms, isn’t that expensive… but in Nepali terms, considering one could get the same dal bhat in the touristy areas of Pokhara and Kathmandu for 100 to 200 Rupees, is pretty expensive…. c’est la vie though, you really don’t have any other option (for the beer drinkers out there, 20 oz. bottles of beer were round $5, but the cost conscious, like myself, could get generally get chaang, local millet beer, or rahksi, local millet wine… tastes like sake… for about $1 to $1.50). There was no need to book ahead, you just showed up pretty much in any village and there were older ladies outside pimping their establishment (their line being, “namaste… you want room… good food… good price… come look”). Ben and I chose places based on the look of the lodge, the vibe of the lady pimp, the size of the rooms and the thickness of the mattresses. 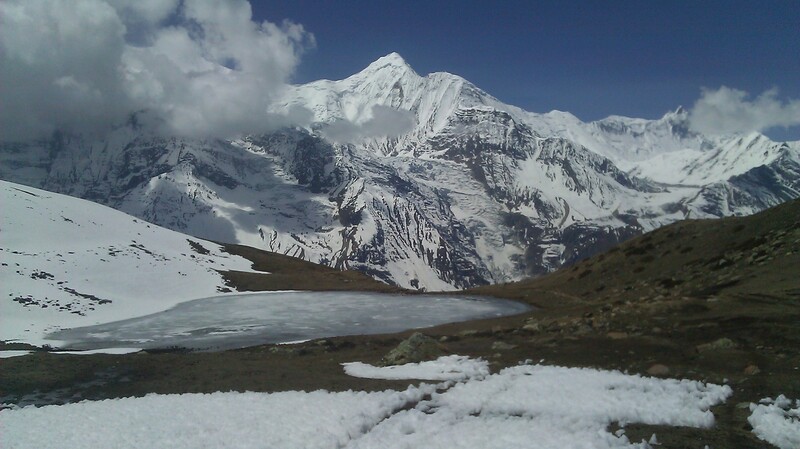 View of Ganggapurna (7,454 mts / 24, 450 ft) from the ice lakes on Day 6. Now… it’s kind of hard to describe the actual trek itself without going to a level of detail that’s a bit too much for blog post, so I’ll throw out some generalities and commonalities to try and paint a picture of the whole thing. A typical day on the ascent for Ben and I…. Get up around 6 to 6:30 AM, some general putzing around, breakfast and packing and bill paying, out the door by 7:30 to 8, hike for 2 hours or so, a coffee/tea/snack break, two more hours or so of hiking, lunch, then an hour or two more of hiking with maybe another coffee/tea/snack break thrown in (we’d stop for little breaks every hour or so while hiking), find a place to stay, wash clothes and shower, chill out/explore, talk to folks if any were around, dinner around 7ish, cards, reading and writing until bed around 9 or 9:30… and we were night owls compared to most people we met on the trek. Most folks were up around 5 and in bed by 8… crazy people in my opinion (once one got higher up in altitude, it was freezing until the sun got high enough to heat the air a bit, around 7 to 8, so why elect to get up really early and hike in the freezing cold?). 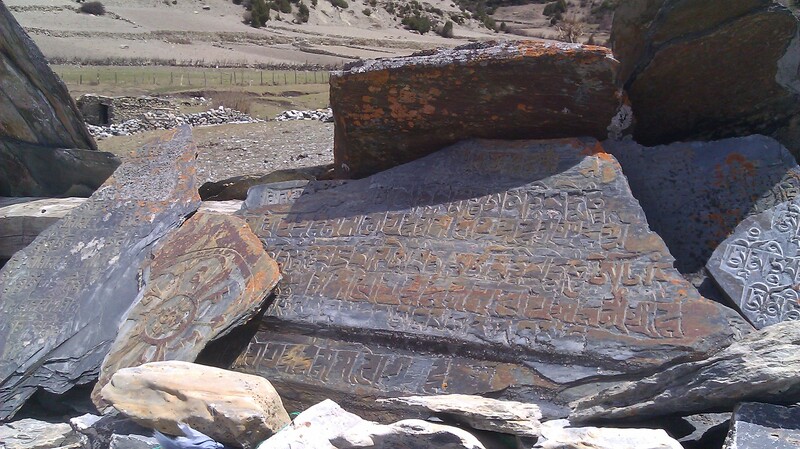 Day 8 Tilicho Base Camp to Khangsar – 8 kms. 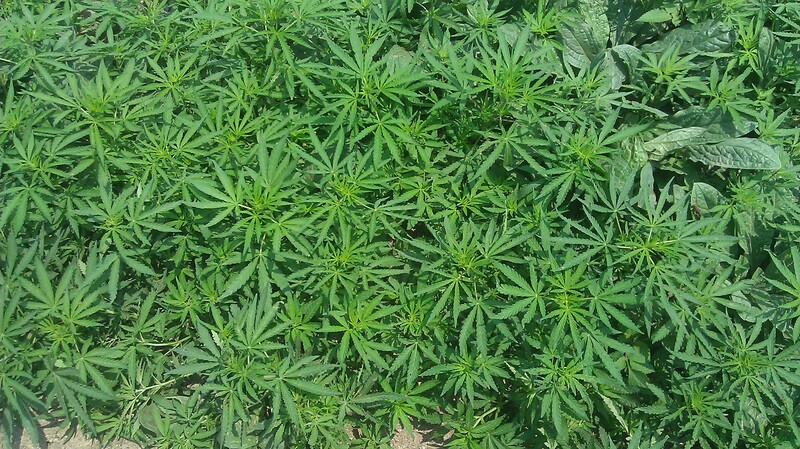 -420 mts descent. 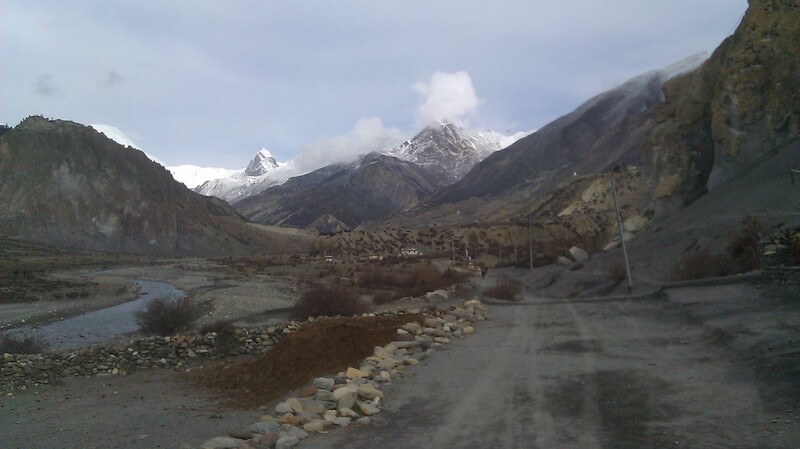 Day 9 Khangsar to Yak Kharka – 15 kms. 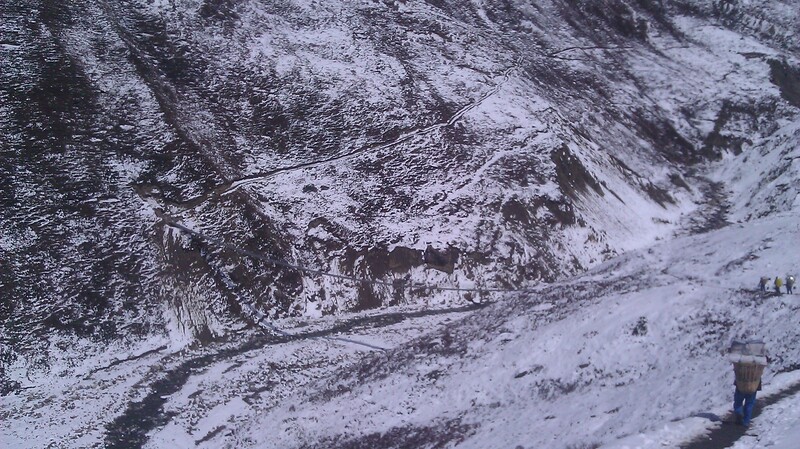 -190 mts descent, +480 mts ascent. 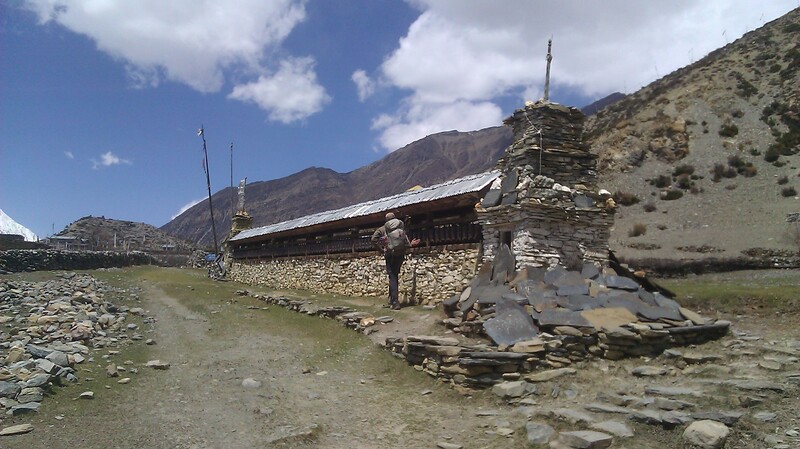 Day 10 Yak Kharka to High Camp (4,930 mts elevation) – 8 kms. 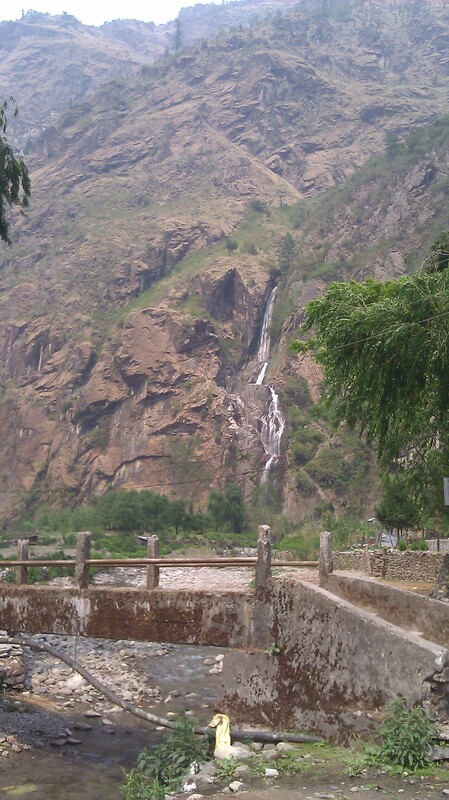 +910 mts ascent. Totals: 10 days, 141 kilometers (87 miles) and about 6,500 meters of ascending (that’s about 21,320 feet, or 4.0 miles of climbing). You’ll notice that the distance covered by Ben and I each day declined as we ascended in altitude… because as one gets higher you have to give yourself time for your body to adjust to the height or you run the risk of getting altitude sickness (which can cause anything from a slight headache to death). Our guidebook called for a mandatory acclimatization day (i.e. sleeping at the same altitude two nights in a row) around the village of Manang, which Ben and I took in Bharka (which is the village before Manang, mostly because we stopped there late in the day and the bakery where we stopped had ridiculously good chocolate cake). The following day (day 6 above), after meeting some people at our lodge who gave us the idea, we decided to take a side trek up to the ice lakes (plus… on an acclimatization day, it’s good to climb higher in altitude, then come back down to sleep). 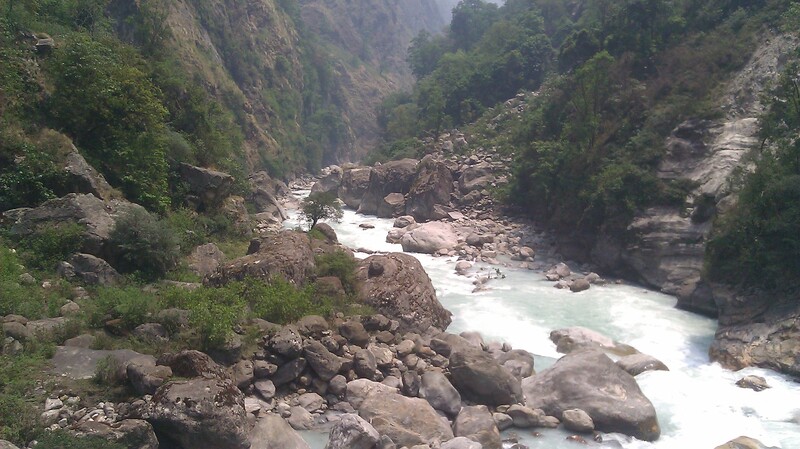 The day we thought we’d start off on a 3-day side trek, but then this happened. So, beginning the night of day 7, through around noon on day 9 it snowed more or less continually, which forced Ben and I to take the longer, but lower route from Khangsar to Yak Kharka on day 9 (which explains the unusually long distance… there’s more direct route known as the high route, but we didn’t want to attempt it in the snow). Although we never had a real problem finding accommodation, in Yak Kharka and in High Camp it was quite crowded… this was due to the snowstorm during the prior days preventing people from crossing the pass, so there was a bit of congestion in those areas (Ben and I did manage to get the last available double room at High Camp… thank you impeccable timing). 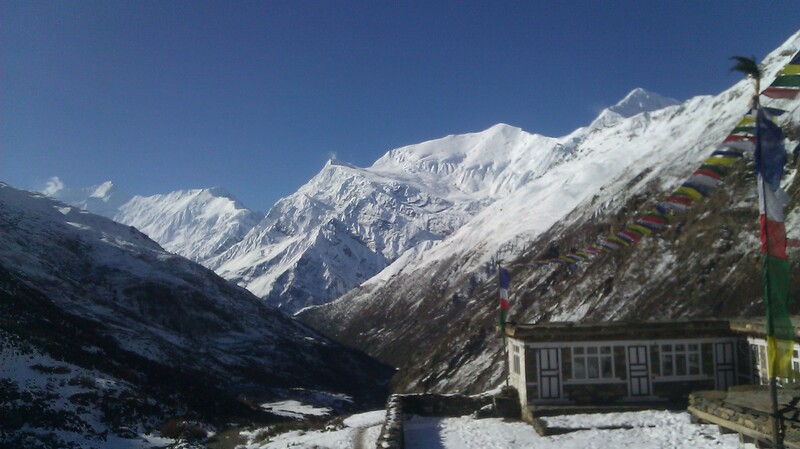 The day before attempting the pass, many folks elect to sleep at Thorung Phedi, which is about 400 meters below high camp (for altitude reasons… sleeping lower down lowers your chances of getting altitude sickness). 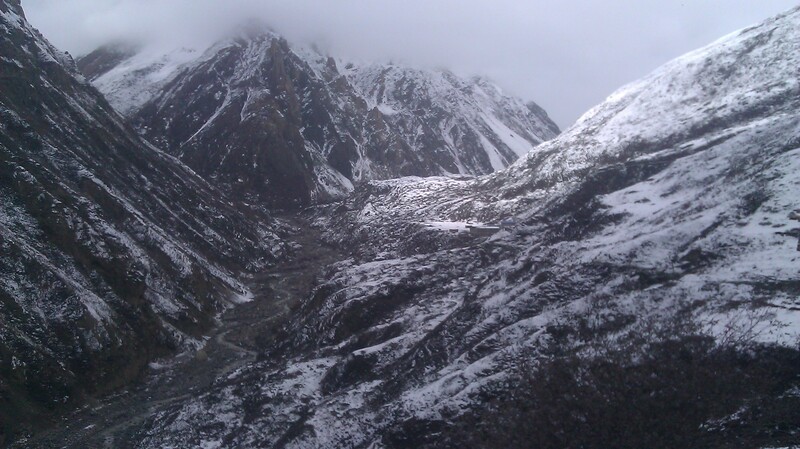 However, the portion of the climb between Thorung Phedi and High Camp is really, really, really (a third really for emphasis is necessary here) steep… I’m talking switchbacks on a snow covered path that go straight up the mountain-side. Sleeping at Thorung Phedi, therefore, entails tackling that climb right off the bat in the AM (there’s still plenty of climbing to the pass after that as well, not to mention the very long descent). Ben and I said f-that… so we climbed that sucker the day before just to get it over with (altitude sickness potential be damned). I’ll leave our journey over the pass for the next post and leave off with a couple more general thoughts about the ascent portion of the circuit. Funny enough, despite all the talk about the road ruining the back half of the circuit, there’s plenty of road on the ascent portion as well… you walk on it quite a bit (by road, I mean a one-lane, dirt, gravel and stone dealio traversed by jeeps), and walking on the road is definitely the worst part of the ascent (very dusty when the jeeps blow by you… plus the constant honking by the drivers is very annoying). The scenery just gets better and better as you go up… the first views of the big snow covered peaks start around the fourth day and just get continually better. 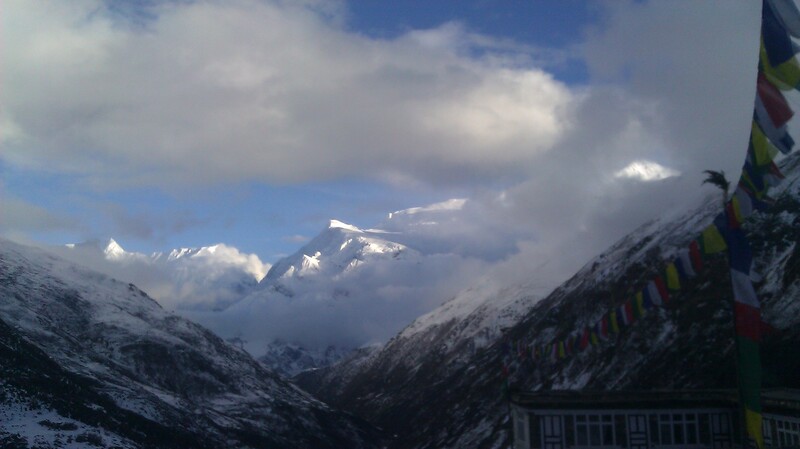 Despite being somewhat ill-equipped for it, the snow was nice… it was a good reminder of the fact that I’m actually in the Himalayas. Although I don’t find it strange anymore (after some of the other treks I’ve done on this trip), if you’re coming here from North America, you’ll find it strange (I know Ben did) that this area really isn’t as wild as you think it should/will be… there’s people living everywhere here… lots of people (relatively). 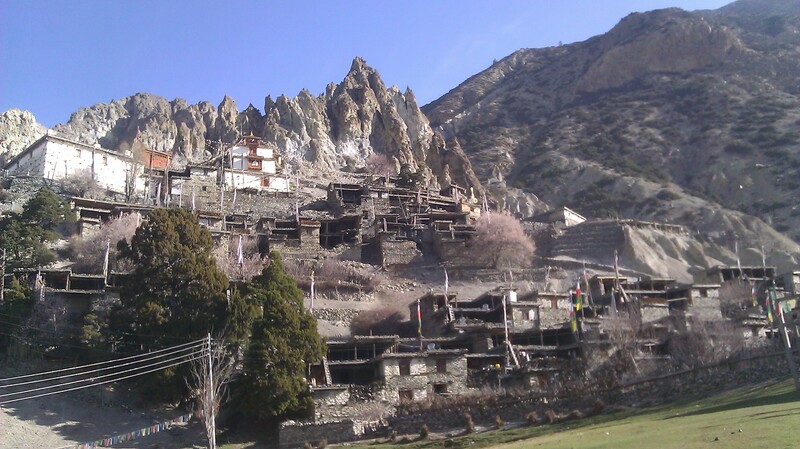 I think it’s hard for us Americans to wrap our heads around the fact that many places in the world are much more densely populated than our own country, and that people will live in even the most seemingly inhospitable places (like the Himalayas… even though it’s not as inhospitable as one would think here) and have been doing so for quite some time… it’s definitely does not feel like you’re out in the middle of nowhere.